The Upper West Side Barnes and Noble is a bit more intimate — if a chain bookstore can ever be intimate — than its sister in Union Square and the evening’s event featured two authors promised as emerging writers, a program that two decades ago, superstar Sherman Alexie was once part of. 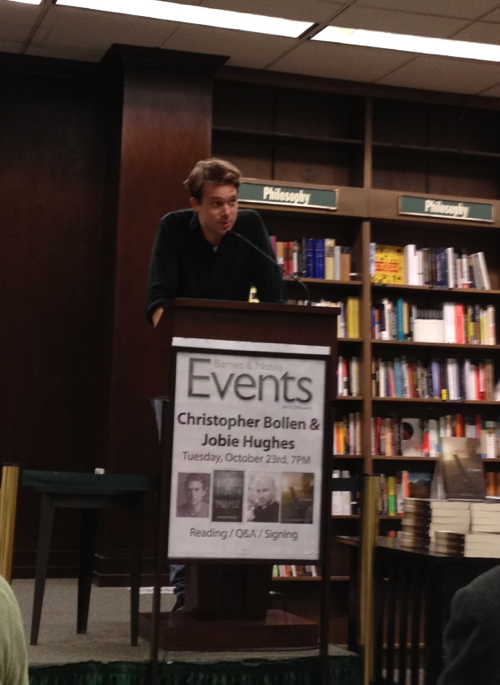 Christopher Bollen was on hand to promote his novel Lightening People, released last year but just now in paperback. Jobie Hughes released his first novel, At Dawn, last week, though he is also a best selling author of two previous books co-written through James Frey’s media content factory. Both novels were introduced as narratives dealing with the coming of age of twenty-somethings in the modern era. Later in the evening, during the Q&A session, Hughes would offer that he was specifically attempting to engage in the Millennial narrative while Bollen intentionally wanted to avoid it. Bollen read first. He opened by explaining Lightening People as an attempt to capture the experience of coming to New York City. His characters arrive in the city from the middlewest, the protagonist from Ohio. Following the brief overview, Bollen read a sprawling selection of short narratives from within the novel. He explained that he intentionally avoided giving away the plot points focusing instead on flashbacks, but the resulting reading meant the audience received only disjointed and unconnected stories that were difficult to follow. None of these choices were helped much by his reading style — quick and mumbling, monotone in all the wrong places. Bollen’s text has moments that should be funny, that demand a hearty laugh, yet, as a performer, he lacks any sense of comic timing. He rolled right through the line “fucked her three times,” in a way that suggested he had no appreciation for the potential humor. But the line was funny, and no doubt would have been if delivered better. In other places, Bollen’s prose seems heavy on metaphors and imagery. His style is one of excess as if he never embraced the beauty in the economy of words. The prose is self involved, self-satisfied, and at times even pompous. At one point, for instance, he mentions the old World Trade Center, how it once served as a lightening rod for the city protecting its inhabitants. But this reference seems artificial, intentionally drawing attention to a before and after of New York City sewn into the text as kitsch rather than purposefully supporting the narrative. Yet Bollen’s characters do connect with the reader and despite the artificiality of the prosaic realm they inhabit, exist in a New York City that is wrought with real New York City problems. They arrive from far off middlewest states and suddenly face the simultaneous crises of youth, poverty, and foreignness. Perhaps this is what drives the realism, that today, the story of New York City is really the story of the arrival of Ohio immigrants on the shores of the Hudson River. 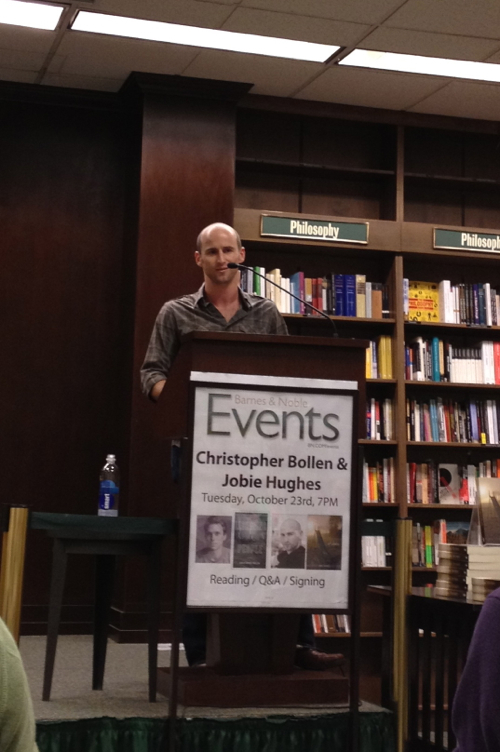 Jobie Hughes then read from his novel At Dawn. He began with only the briefest of introductions before jumping into the reading at full speed. He read with better awareness of his audience and with a keen sense of comedy, but sped through his text too quickly. At times, Hughes tripped over words as he raced along, but this was his performance rather than his prose. Practice would improve his public readings. He writes with an admirable efficiency of words, even if from time to time, too many adverbs appear. His text is well polished otherwise, and often hilarious. He is funny. The excerpt he read follows the early moments of a relationship between a young woman and only slightly more mature man. Midway through, Hughes interrupted the reading to apologize if his narrative was growing too sentimental. This interjection seemed unnecessary. These are characters in crisis, even if they aren’t yet aware of it. They are desperate and despondent. They long for something, though neither of them truly understands what they are missing, what they want for. Ultimately, even though these are people in Chicago, they are likeable and interesting. Following the reading, Hughes and Bollen sat through a question and answer period. Hughes made a strange metaphor about how writing is like wrestling with the importance of repetition. He revealed too that At Dawn required twelve drafts to sell and another six to publish. He workshopped pieces of it during his time in the Columbia MFA program. Bollen worries about writing too much, and seemed appreciative of his literary agent for playing an active role in developing the novel. Hughes also tread delicately around the first two novels he co-wrote, but can’t talk about. Following his MFA program at Columbia, Hughes paired up with award winning, award forfeiting author, James Frey. Following the wild success of his novel-memoirs, Frey launched a book mill, compared all too often to Andy Warhol’s art collective. NY Mag did a write up that wasn’t all that flattering. The subject of the earlier books seemed to continually come up in audience questions, and Hughes became visibly distraught. His contract with Frey keeps him under a gag order. Frey has apparently not been kind to Hughes despite two books and a film. America and Oprah might feel betrayed over the semi-fraudulent A Million Little Pieces, but the real outrage should be with Frey’s cowardice hiding behind the non-disclosure agreement that prohibits Hughes from refuting any of the maligning press about their relationship. It is of course impossible for two authors to share a reading and not face inevitable comparisons. While both their novels have many common elements–big cities, characters fleeing the hinterland–their two styles are remarkably different. Hughes is more polished, more efficient, but perhaps less elegant. If anything, Bollen is more ambitious, and whatever shortcomings his text might contain, its owed to a willingness to take risks, something lacking from Hughes. Still, while I don’t necessarily read the novels of every author, I will likely read both of these anticipating two different experiences: an honesty from Bollen and wit from Hughes.